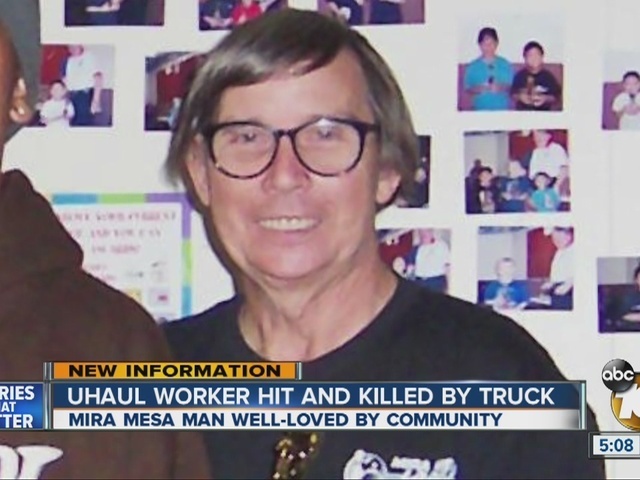 SAN DIEGO -- An employee was run over by a rental truck and killed Thursday morning at a U-Haul business in Mira Mesa. The accident at the lot on Camino Ruiz near Miralani Drive was reported about 6:45 a.m., San Diego police Officer Frank Cali said. Police said Alfred White exited the truck for some reason while it was running. It started rolling, with the open door hitting him and knocking him to the ground, and then he was run over, according to the officer. 10News learned the 80-year-old White was well-loved in the community. He has been a volunteer at a local bowling alley for the past 20 years. Christy Balla, manager at Mira Mesa Lanes, told 10News she knew White for more than 20 years. "If I could be a quarter of the human being that he was, to other people that I come in contact with, I feel like that's a blessed life," Balla said. White coordinated the bowling youth league and had done so for years. He volunteered and mentored more than 200 children every Saturday. Balla said she had never met anymore more generous and giving of his time and attention. "It just hurts the most because he had an amazing impact on people around him," she said. Richie Perez has been mentored by White for more than three years. He told 10News that White "taught me how to bowl." "When I got my high game in bowling, like people felt really happy about me," Perez added. Balla said White would volunteer his time and money to take children to the tournaments. He would drive the children home after late nights. "What a loss the children are going to have," Balla said. Mira Mesa Lanes will be organizing a scholarship to honor White. Anyone interested in donating is asked to email Balla at cballa@miramesalanes.com .